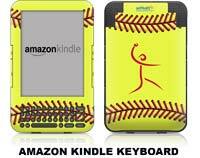 What better way to show off your e-Reader device than with a game stopping softball skin from Softball Excellence. 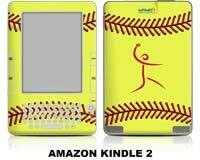 Give your e-book reader a cool softball look and help protect it from scratches at the same time! 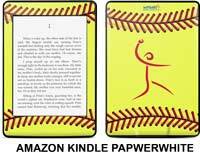 Our full-color softball skin kit are digitally printed on premium grade adhesive-backed cast vinyl then covered with a clear protective coating. They use innovative, repositionable and removable adhesive backing for fast, easy and accurate installation and goo-free removal! 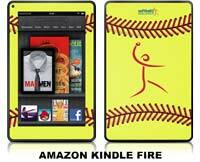 They cover the front and back of the e-reader and do not interfere in any way with the operation of the reader. Our skins also arrive in attractive retail packaging, which means they are perfect for gift giving! 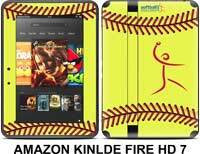 Amazon Kindle Paperwhite released on October 1st, 2012 features a new brightly backlit touch screen and unbelieveable battery life. Shipping charges quoted are for shipping withing the U.S. ONLY, for a quote on international shipping of this item please call or email us.